Creating an SEO-friendly white papers ensures you rank higher in search engine results, which leads to more publicity, media coverage, and business. 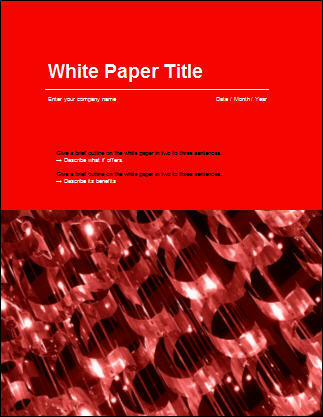 Develop an SEO template and shoe-horn the white paper into the structure you’ve created. Write the white paper first, then check that it is SEO friendly. Using the SEO template means that you have to adjust the content to fix a structure that will probably interrupt the narrative and flow of your document. Best to avoid this. Instead, write the white paper first, then go back, use the SEO checklist and make sure that you adhere to best practices. This writing approach means your documents read more naturally while also embracing the guidelines suggested by Google, Bing and other webmaster guidelines. Keywords – identify the three keywords that relate to your topic. In most cases, these will already be in the white paper title. The point here is to use these, without overdoing it, in the headings and sub-headings to compliment the text but not to distract the reader from the content itself. Headings – frontload the primary keyword at the start of the heading, for example, instead of Mobility security for Android apps, write Android devices: mobility security guidelines. However, don’t overdo it. Structure the headings correctly. Don’t remove words that help or orient the reader. Sub-headings – same idea here, though you want to avoid overdoing the frontloading. Consider sprinkling keywords into the sub-head in a natural way. Remember to use synonyms. Images optimised – if you include images, especially if they appear on a web page, reduce the file size as much as possible. Search engines reward quick download speeds. Massive images work against you. Image name – use meaningful names, for example, android-style-guide.jpg not 123456b.jpg. It’s a small detail but it helps. Image captions – help the search engine understand the index the image by adding a caption and ALT text. Social media enabled – add social media button to increase shares. You can also add these to the PDF. Hierarchy – put key facts and important details at the top of your webpage. This also helps orient the reader. Short text – consider the following guidelines for web text: Headings: 4–8 words; Subheads: 1–5 words; Sentences: 1–20 words. Web friendly text – write scannable text that is easy to read on the web. Chunk information; use heads and subheads to help content flow; use bulleted lists instead of blocks of text. Mobile friendly – develop content that reads well on a small device. Use lots of lists, headings, and short sentences. Break up large blocks of text. Avoid using non-standard fonts. Fast to load – optimize the web page and PDF so it downloads fast. Reduce clutter. Remove special effects that can cause browser issues. You can test the speed of your webpage on Google’s PageSpeed Insight page here. Metadata correct – for PDFs, check that the file properties are correct, for example, it states the author name, document title, and keywords. In MS Word, you can apply these settings in the File tab under the Properties section on the right of the page. Click Show All Properties to see all options. Update the Author, Title, and Keywords. Embedded links – include links to other related documents. Links to third parties – link to articles and sites referenced in the paper. Write a series of articles – if possible, write a series of articles, then link them all together. This helps the search engines index the content. Think of a library. The more articles you write about a specific subject, the more likely you are to get indexed correctly. High word count – demonstrate your authority by providing in-depth information. The web is polluted with shallow, thin content. Make yours stand out. Aim for three to five thousand words. That’s about 10-15 pages. If you write three pages a day, you’ll be there by Friday. In-depth expert point of view – improve the integrity of the document with quotes, stats, references. If you are going to quote, use three to five lines. More than that looks questionable. Write for humans first, then search engines. This tactic works as the quality of your document determines if readers will share, recommend, or quote it. And it’s these endorsements that determine how Google will value your white paper. This means when Google does arrive at your digital doorstep, you will have the content structured correctly, applied best practices, so you are indexed and ranked correctly.